They say it could one day render organ donation obsolete. In what the Israeli media is calling a “world’s first,” scientists at Tel Aviv University have 3D printed a small heart using human tissue that includes vessels, collagen, and biological molecules — a breakthrough, according to Haaretz, that they hope could one day render organ donation obsolete. The technology is still many years out from human transplants, though — the team’s rodent-sized printed heart isn’t quite there yet. “The cells need to form a pumping ability; they can currently contract, but we need them to work together,” lead scientist Tal Dvir told Haaretz. “This is the first time anyone anywhere has successfully engineered and printed an entire heart complete with cells, blood vessels, ventricles and chambers,” Dvir said. 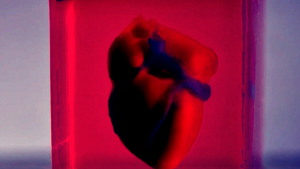 To print the heart, the scientists created a “personalized hydrogel” to form “bioinks,” according to a paper published today in the journal Advanced Science. The hydrogel originated from fatty tissues extracted from human test subjects.